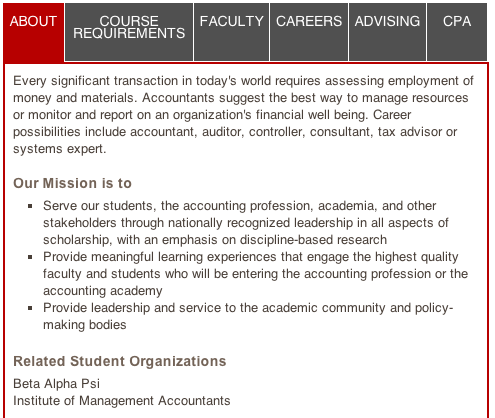 Information about an undergraduate degree in accounting, including course requirements, advising information, and FAQs. Information about the IMAcc program, including admissions, financial aid, and course requirements. Information regarding the GMAT. Taking the GMAT is a requirement for students accepted into the IMAcc program. Contact Kristen Fuhremann at kfuhremann@bus.wisc.edu with additional questions regarding the IMAcc program. FREE software training for UW-Madison students, through the Department of Information Technology. Includes Excel, Adobe, QuickBooks, and most widely available software. For up-to-date information about the CPA exam. Use BuckyNet to apply for jobs and internships and schedule on-campus interviews & advising appointments. Keep up with the myBiz blog to follow events happening in the Business School.